A gorgeous book this is. Everything about it breathes exquisite taste and care. Designer Susan Marsh and typesetter Tina Henderson created the perfect foil for this unique collection of Dutch Art Nouveau prints from the Museum of Fine Arts, Boston. Curator Clifford Ackley signed for the 2013-14 exhibition concept and contributed a no-nonsense introductory essay and thoughtful notes accompanying each of the presented works.The frontispiece is Jan Toorop's 1894 'salad oil' poster for the Nederlandse Olie Fabriek, an image that became so iconic that Art Nouveau in Holland was often dubbed the 'slaolie stijl' (salad oil style). There is inevitably a lot of the polymorphous Toorop in this book, and none the worse for it. Jan Toorop: Sick Child (1898)The real discovery for me were the astonishing animal prints of Theo Van Hoytema. His Angora Rabbits and White Egrets lithographs (1898), evocative of Chinese monochrome ink paintings, are arresting works, no doubt amongst the best that Art Nouveau/Jugendstil has to offer. Amongst the many other highlights are Lion Cachet's batik-inspired Good Samaritan (1896), Theo Niewenhuis's Botanical Studies, Schelfhout's proto-cubist Tree near a Lake (1913) and Holst's 1918 poster for Faust. 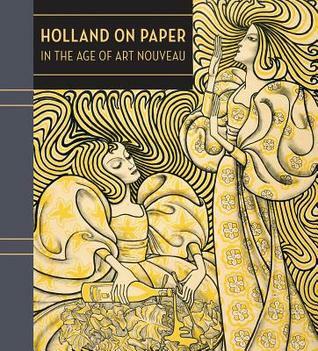 This book was an excellent springboard for an extensive session of pinning and googling, which led to a renewed appreciation for the scope and sophistication of the Dutch Art Nouveau scene. By the way, I bought this treasurable tome at a deep discount price in the Brussels Royal Museum of Fine Arts' well-stocked bookshop.